This Baby Board was made by my great grandparents Frank & Estelle Duval. 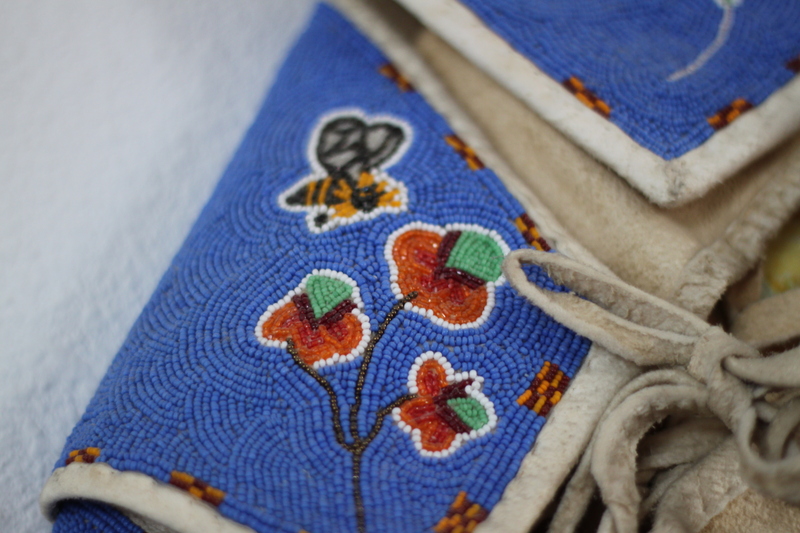 My great grandpa cut the board and my great grandmother completed the sewing and bead work. It is the second baby board they made. It is the one I grew up seeing the most frequently so I feel a strong attachment to this treasure. It currently hangs on my grandmother’s living room wall. My Aunt Vicki is constantly trying to talk my grandma into moving it to her wall instead. So far my grandma has held her ground. I’m guessing that one of these days I’ll see it on Aunt Vicki’s wall. 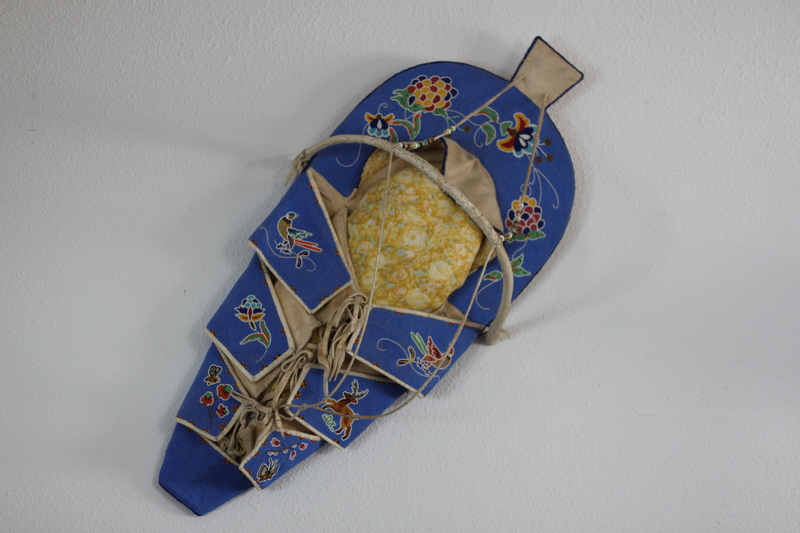 This baby board is one of the many amazing items my great grandmother beaded. I think her work is beautiful, meticulous, and so intricate. Below are some close up shots to show off the fine details. You can click to enlarge. I am in awe of my great grandmother’s many talents. She was amazing! 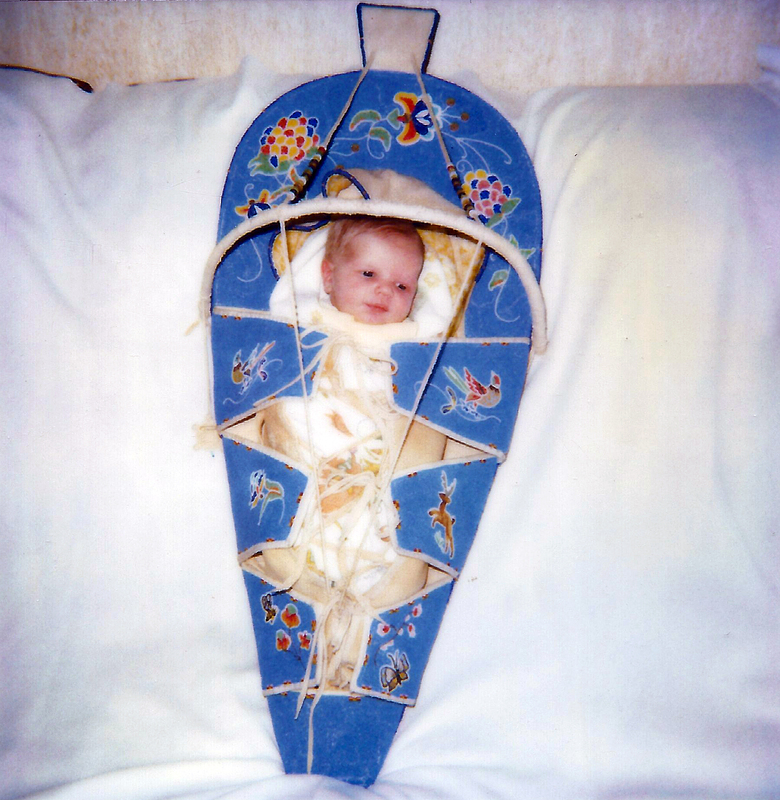 My cousin Matt in the baby board, 10 May 1985. Wow! I have never heard of anything like this! When I saw “baby board” in the title, I was thinking, “No, a baby doesn’t *really* go in there, does it?” Then I saw the last picture of your cousin! What was the purpose of a baby board? It was BEAUTIFUL by the way!! Hi Melanie. Great question. First, thank you, I think it’s beautiful also. You asked what the purpose of the baby board was. This particular baby board was made as a display item. My great grandmother loved to create things. She was always making something beautiful for her home or the homes of her family members. 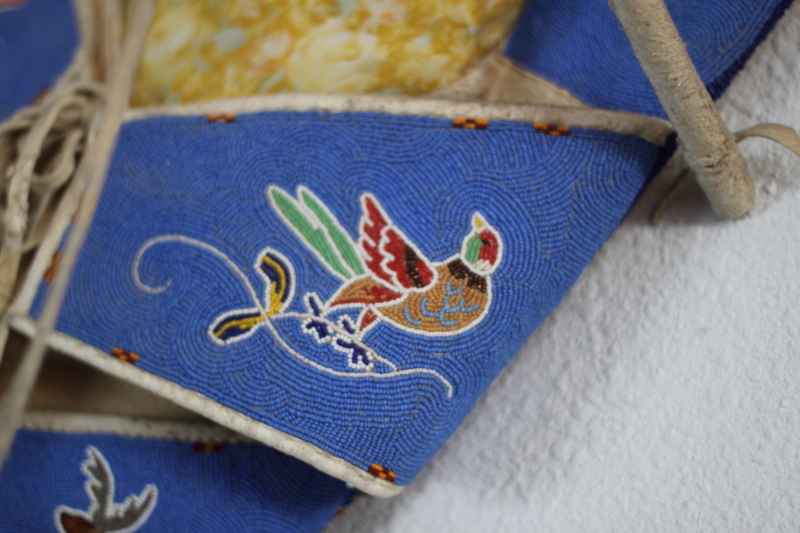 Once she started beading she took on more and more intricate projects. This is the second baby board she made. She would display them at ‘Indian Shows’ and in her shop when they weren’t hanging on her own wall. I’m not sure exactly what constitutes an ‘Indian Show’, I only know that is the phrase my great grandfather used. While she had a shop, it is my understanding that she only sold raw materials, no finished products. 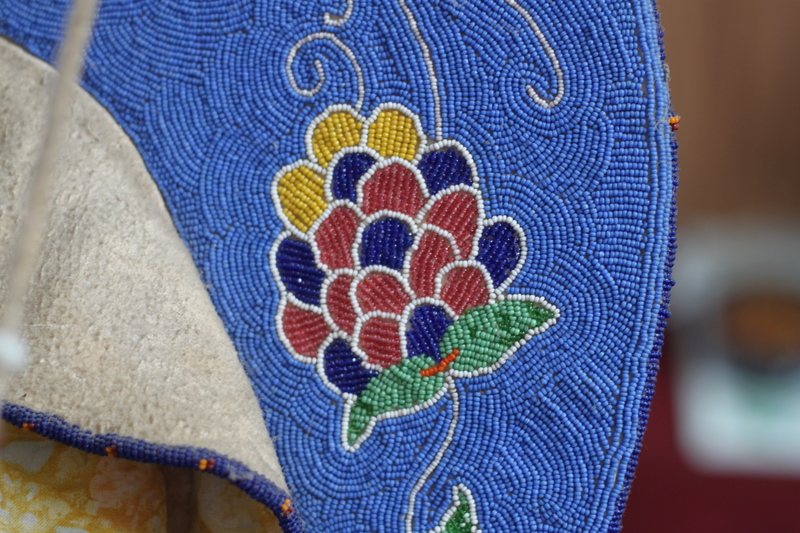 All of her own bead work was done for personal enjoyment and as gifts for her family. She was a collector and she would also take things in on trade and functioned as a pawn shop for local Native Americans. Sometimes they would return and reacquire their items from her and sometimes they would not. So after that long ramble, this baby board was only ever intended for display. My cousin Matt was put in it simply because it was fun to put it to use for a minute and take a picture and reminisce about the wonderfully talented woman who made it and had since passed away. Yes that did explain it! Thanks! Your great grandparents’ craftsmanship is beautiful. It looks so pristine i can’t imagine this baby board was ever used. Did your family use baby boards? Was it a native American tradition for them? Did they use it as a baby carrier (transportation) or as a bouncy seat (indoor confinement)? Were your grandparents the last to ride in them “for real?” 🙂 What a wonderful family relic! No it wasn’t ever used. It was created as a display item after all of their grandchildren were grown. It was probably finished a few years before I was born. I am the first great grandchild. My mom doesn’t remember if I was ever put it in but knows that a few of the great grandchildren were put in it for a few minutes. The only photo I have found is the one I posted of my youngest cousin Matt. My great grandparents were both French Canadian – she is almost completely French Canadian and he is half. There are a few pieces of evidence that there is Native American blood but nothing I can prove. There is quite a bit of interest in Native culture within my family. Everyone in my mom’s generation have a lot of Native American items on their walls as does my grandmother. She was actually married on a reservation and her husband (my mom’s step-dad) is part Cherokee. I agree – fabulous family relic for sure! 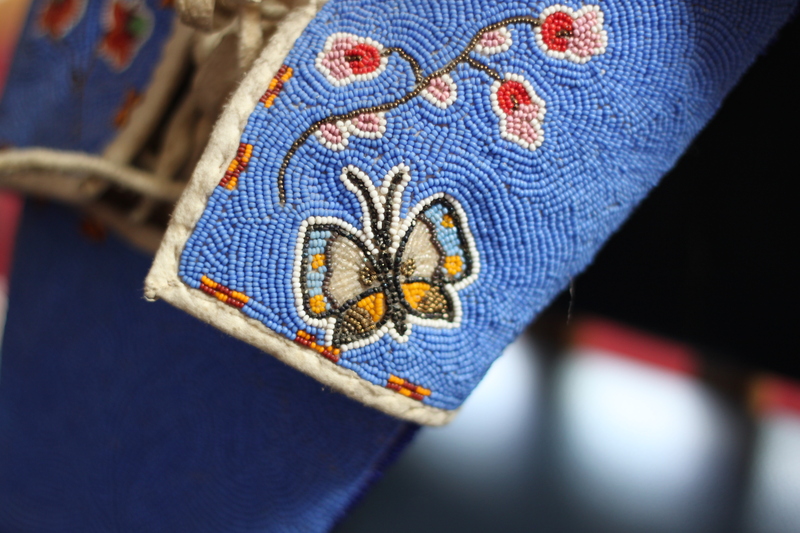 that is beautiful beadwork! Yes, please tell us more of how it was used. Hi Laura, I answered the questions Melanie and climbing greenwood asked so you’ll have to click back over and read them for the details. Thanks for this interest, I think it’s a pretty cool item! How awesome to have such a beautiful item still in your family AND in such pristine shape. Am curious tho, how you g-grandparents made something that looks so Native American? Were there Indians where they lived – do you have Indians in your heritage? Thank you, I agree, it’s lovely and well cared for. They lived in Spokane and there is at least one reservation right there. My post yesterday talks about how my grandma transitioned her photography studio into a bead shop, well a combo of both actually. 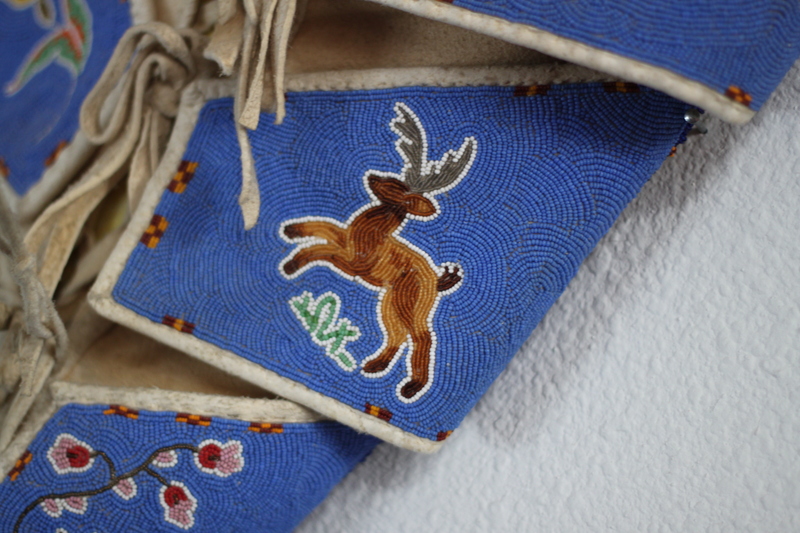 She started beading with Native American women that she photographed and it grew from there. Wow, the baby board is amazing! Your great-grandparents had awesome design and craft skills. Thank you Sheryl, I agree! This is absolutely gorgeous. I had never heard of a baby board. Her beadwork is amazing! Thank you Linda, I think so too! This one and the other are just gorgeous. And the letter in the other was such a nice touch. Have you taken a DNA test to see if you have Native ancestry? Regardless, these are so special to have in the family. Yes, definitely get them first! I heard the ftDNA is where the serious genealogists congregate. But if you do it at 23andme or Ancestry I think you also add raw data over there later on. Thanks for the tip. I’ve been collecting as many tips as I can!